Lucas is the protagonist of the Japan-only game Mother 3 from the Mother series. In this game, he lived with his twin brother Claus and his parents Hinawa and Flint, in Tazmily Village located in the Nowhere Islands. However, tragedy soon strikes his family, as his mother is killed and his brother is lost, both of which set in motion Lucas' adventure to contend with the Pigmask Army and its leader Porky. Lucas rides in on a tea table shaped like Mr. Saturn. Lucas appears in Super Smash Bros. Brawl as a playable character, one of the two representatives from the EarthBound series. Lucas' special moveset is almost exactly like Ness' from the previous games, but with a few minor tweaks. His neutral special is PK Freeze, which sends up a snowflake-shaped blast of PSI energy that freezes opponents caught in its blast radius when Lucas sets it off. His side special is PK Fire, which sends out a lightning bolt-shaped blast of PSI energy directly forward that explodes when it hits. His down special is PSI Magnet, which sets up a barrier of PSI energy in front of himself that absorbs projectiles to restore damage and attack when the barrier is dropped. His up special is PK Thunder, which discharges a streaming, electric blast of PSI energy that can attack opponents and/or propel Lucas. His Final Smash, also shared with Ness, is PK Starstorm, which sends groups of shooting stars raining down on the stage in an inward direction. Lucas does not actually learn any of his special moves in Mother 3; rather, they are all learned by his party member Kumatora. However, almost all of Lucas' normal moves and smash attacks are completely different. The only exception is his forward smash attack, which operates similarly to Ness' baseball bat, albeit with Lucas wielding a stick instead. 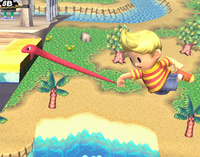 In addition, Lucas' grab is the Rope Snake, a weapon used by his party member Duster, which also acts as a tether recovery. One of Lucas's alternate costumes resembles his brother Claus. Lucas's home stage is New Pork City. Lucas was originally meant to replace Ness in Super Smash Bros. Melee. However, this was averted due to Mother 3 for the Nintendo 64DD, then unofficially known in America as EarthBound 64, was canceled. Nonetheless, Mother 3 was later rescheduled and redeveloped for the Game Boy Advance in 2003 and was released in 2006, though only in Japan. Lucas is voiced by Lani Minella, who also voices Pit. In the Subspace Emissary, Lucas is shown as a weak, shy and timid figure, almost identically to how he appeared in the beginning of Mother 3. Lucas first appears alone in the Ruined Zoo. He is attacked by The Pig King Statue, but Ness arrives to save him. They proceed to fight Porky, but then Wario arrives with his Dark Cannon and attempts to hit Ness with it. Ness dodges his attacks, so Wario tries to attack Lucas instead. Lucas doesn't move out of the way, so Ness ends up taking the hit himself. Lucas, scared, runs away and meets the Pokémon Trainer, and they join to fight the Subspace Army, as Lucas cannot forget what Wario had done to Ness. Outside the Ruins, the Pokémon Trainer decides to capture a Charizard that flew by. Before entering them, however, they are ambushed by Wario. They defeat him, but Lucas becomes disappointed that Wario doesn't have Ness with him anymore. After capturing Charizard and an Ivysaur inside the Ruins, Lucas and the Pokémon Trainer reach the Ruined Hall, where they are attacked by Galleom. After defeating him, Galleom takes them and starts flying into the air, with a Subspace Bomb in his head about to go off. Lucas frees himself and the Pokémon Trainer, and they are then saved by Meta Knight, whose team they then join. At The Glacial Peak, Meta Knight leaves them, but they are then joined by the Ice Climbers as the Subspace Army is sent out to attack them. Mario, Link, Yoshi, Kirby and Pit then appear and defeated the enemies. Soon, the other remaining heroes show up and they enter Subspace together. Unfortunately, Lucas and the others were defeated by Tabuu. But then Lucas is saved by King Dedede, who had revived Ness and Luigi with badges. All of the revived heroes then fight and defeat Tabuu. 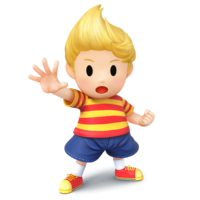 Lucas was released as the second downloadable playable character after Mewtwo in Super Smash Bros. for Nintendo 3DS and Super Smash Bros. for Wii U, on June 14, 2015. Visually, Lucas' moveset is almost totally unchanged from the previous game, though his Final Smash, PK Starstorm, has been altered to be similar to Ness' version. Additionally, Lucas has three alternate costumes, which feature sprites of the Masked Man, Boney, and a baby Drago on his shirt. 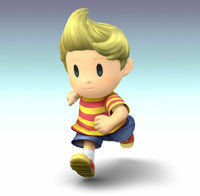 Lucas appears as a playable fighter in Super Smash Bros. Ultimate. His moveset is mostly unchanged, but Lucas is now assisted by Kumatora and Boney for PK Starstorm. Lucas receives improvements to his mobility, while his grounded and aerial attacks come out quicker. Lucas's damage output receives a mix of positive and negative alterations (such as up aerial dealing 11% instead of 13%, while his down throw deals 11% instead of 6.5%). Several of Lucas's attacks receive names: his up smash is PK Smash Geyser, his down smash is PK Blow, his back aerial is PK Meteor Kick, and his down aerial is PK Foot Stomp. Magic, Sacred Powers, and PSI! PK Freeze is Lucas's standard special move and a PSI attack appearing in every installment of the MOTHER / EarthBound series. 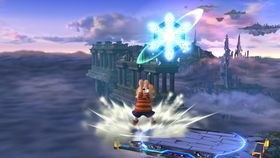 When used, Lucas sends a snowflake into the air that travels in an arc in front of himself automatically unless influenced and for as long as the special attack button is held, and freezes opponents rather than exploding. Opponents stay frozen longer the longer the move is charged. The move automatically strikes once it hits the ground or once it reaches the altitude at which Lucas started the move, but if it lands at a point above where it was originally started the attack disappears without damaging. After using the move in midair, Lucas is left helpless. PK Freeze also appears as Ness's second custom variant for his standard special move PK Flash in Super Smash Bros. for Nintendo 3DS / Wii U.
PK Fire is Lucas's side special move and a PSI attack appearing in every installment in the MOTHER / EarthBound series, shared with Ness. When used, Lucas fires a bolt of lightning from his fingertips similar to Ness, although Lucas's travels directly forward when used on the ground or in the air, but it pushes him back a set distance. Upon hitting an opponent, the bolt bursts into a wave of fire that hits once. PK Thunder is Lucas's up special move (shared with Ness) and a PSI attack appearing in every installment of the MOTHER / EarthBound series. When used, Lucas produces a ball of lightning that can be controlled using the control stick. Compared to Ness's PK Thunder, which hits only once before disappearing, Lucas's is able to travel through opponents and can curve more quickly, although it is slower and has a shorter lightning "tail." While controlling the lightning ball, hitting Lucas himself with it causes him to fly in the opposite direction he was hit, which also deals multiple hits similar to Lucas's standard PK Thunder. PSI Magnet is Lucas's down special move (shared with Ness) and a PSI attack from the MOTHER / EarthBound series. When used, Lucas creates a field of energy that absorbs projectiles to recover damage, although unlike Ness's PSI Magnet, Lucas puts it up in front of himself, though he turns around when hit from behind. Lucas also recovers more damage than Ness. PK Starstorm is Lucas's Final Smash, shared with Ness and based upon the PSI attack appearing in both EarthBound and Mother 3. When used in Super Smash Bros. Brawl, Lucas summons groups of meteors that rain down inward and onto the stage, damaging anybody hit by them, although they deal slightly less damage compared to Ness's PK Starstorm. In Super Smash Bros. for Nintendo 3DS / Wii U, like Ness's version in this installment, the meteors no longer rain down randomly across the stage, instead being concentrated in one area, raining down from the center of the stage. The angle at which the meteors fall can be adjusted with the control stick, and the meteors now deal fire damage. Lucas's deals less damage than Ness's, but has a higher knockback. In Super Smash Bros. Ultimate, PK Starstorm has been changed to be more similar to the Super Smash Bros. Brawl variant, and Kumatora and Boney now appear beside Lucas to assist him. In Super Mario Maker, Lucas appears as a Mystery Mushroom costume, which plays the sound effect from Mother 3 when an important item is obtained upon transforming into him. The costume can be randomly unlocked after completing the 100 Mario Challenge on Expert or harder, or unlocked by scanning the Lucas amiibo. Instruction manual: A youth with pronounced psychic powers. His PK-based attacks hit hard. Website: The youth with the psychic powers has appeared—it’s Lucas! He makes his anticipated debut from the Japan-only release MOTHER 3. While he is timid in nature, he fights splendidly. Is it possible he can surpass even Ness?! GBA Mother 3 (Japan Only) The younger of twin brothers living in Tazmily Village in the Nowhere Islands. He's a kind boy who can communicate with animals, but he's shy and never really got over the tragedy that struck his mother. He fights a warped dictatorship, hunts the Seven Needles, and crosses swords with his missing brother, Claus. In the end, the young boy with psychic PSI powers grows up. Mei Ling: I see you're fighting Lucas, Snake. Mei Ling: That boy has PSI powers, which he can use for different kinds of attacks. But the poor little guy's had such a hard life. His mother was killed when he was young, and he was separated from his brother. After that, he faced all kinds of senseless hardships, and he slowly grew stronger. Snake: Senseless hardships--yeah, I had a lot of those, too. The question is how you translate those hardships into a better future. Mei Ling: ...Mmm. Well, I hope things turn out OK for him. GBA Mother 3 (Japan) Before adventuring, Lucas was a timid, cautious boy. His journey has made him a stronger person. Maybe he met someone to spend his life with... Hang on—we're moving way too fast! For now, remember that Lucas and Ness are favorites in the hearts of EarthBound fans. Once upon a time, Lucas was a bit of a cry-baby. You might even say he was a wimp. But then, well...he had more than his fair share of rough times and toughened up a bit. Who knows what he's up to now? Whatever he's doing, his story - much like Ness's - lives on in the hearts of all Mother series fans. GBA Mother 3 (Japan) The younger of the twin brothers from Nowhere makes his triumphant return to the game of Smash. 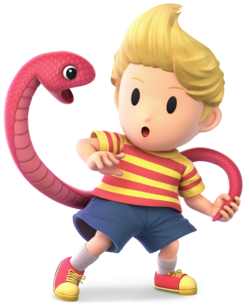 Hailing from the Japan-only game Mother 3, Lucas's specialty is psychic projectile attacks. He can use these PSI attacks to do things like absorb enemy projectiles and deal supernatural damage! Lucas, the younger of the twin brothers from Tazmily, comes originally from the Japan-only game, Mother 3, and now makes his triumphant return to Super Smash Bros.! Here he makes great use of his PSI powers with lots of projectile attacks, and can use his faster attacks on anybody who gets too close. GBA Mother 3 (Japan) Lucas's up special PK Thunder can hit enemies multiple times, but if you hit yourself with it, you can then tackle and launch opponents! Lucas’s up smash has the strongest launch power of any fighter's up smash. The range for this attack is wide, and it's strongest right after Lucas unleashes the attack. Lucas's up special, PK Thunder, can either hot enemies multiple times, or hit Lucas himself to push him into a powerful charge attack. Meanwhile, his up smash attack is the most powerful launching move in the entire game, so make good use of it! It's a wide-range attack that is most effective right after Lucas unleashes it. You can adjust the direction of the shooting stars in this attack! Rain stars down on multiple fighters at once, or be mean and pick on a single fighter. The choice is yours! If a star connects, it will deal ongoing fire damage, making it hard for opponents to return to the stage. The following dialogue applies also to Mewtwo, Roy, Ryu, Cloud, Corrin and Bayonetta, who are also downloadable fighters. The younger of twin brothers living in Tazumili Village in the Nowhere Islands. He's a kind boy who can communicate with animals, but he's shy and never really got over the tragedy that struck his mother. He fights a warped dictatorship and hunts the Seven Needles, using PSI attacks to do things like absorb enemy projectiles and deal supernatural damage! Though Lucas' Japanese name was meant to be pronounced like the French pronunciation (with the 's' at the end silent), the English versions of Super Smash Bros. Brawl and Super Smash Bros. for Nintendo 3DS / Wii U pronounce the 's' anyway. Lucas is shown to have visible teeth in the cutscenes of the Subspace Emissary, despite not having any during actual gameplay. This distinction applies with Ness as well. ↑ Downloadable Content Info. Official Site - Super Smash Bros. for Nintendo 3DS / Wii U. Retrieved June 5, 2015. This page was last edited on March 28, 2019, at 09:36.